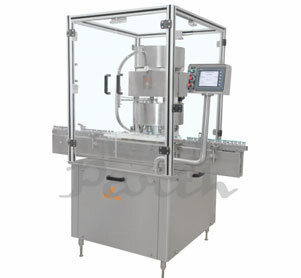 Our vial cap sealing machines comes in 5 different alternatives namely- Automatic 1/4/6/8/12 head vial cap sealing machine. The increasing number of heads corresponds to the increased rate of production ranging from 36oo vials/hour to 12000 vials/hour. The vial capping machine has a self-supportive structure possessing stainless steel legs and also comes up with a height-adjustability system. This system allows the vial cap sealer to incorporate a plethora of products with varying dimensions. It has matt finished body working on low power producing low sound levels. The guide profile of the vial capper machine is self-lubricating thus providing it from frictional wear and keeping the temperature low when operated for the longer duration of time.